On this page, I describe the work that I've been doing to implement a method of train detection on my layout. My layout uses 3-rail tubular track so all of the work that I've done is with that kind of track. I expected to see (and I did) that the metal track would affect the operation of the tag reader. This is based on the work that I did for the Remote Train Control (RTC) program and OOK Radio Support. For help and other ideas, join the RFID For Model Railroading Yahoo! group. Two people that I've been working with have implemented schemes to do train detection. 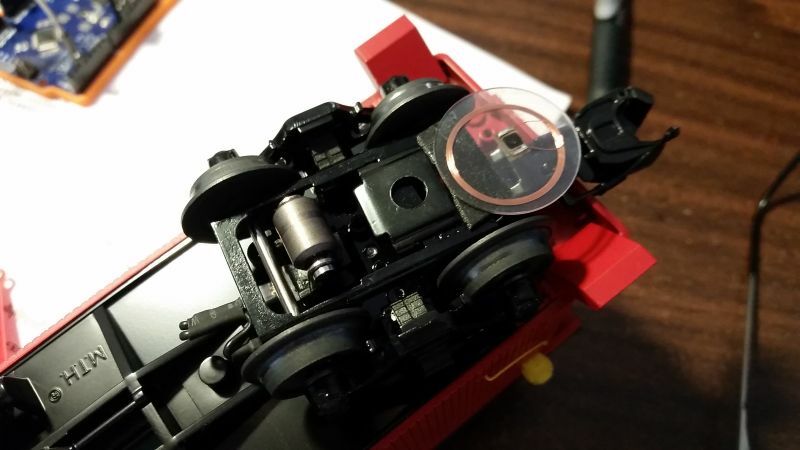 Mike has implemented a scheme where the tag reader is inside of a car. The tags are mounted below the track. The tag reader detects a tag and sends a response via a Zigbee radio to the control computer. 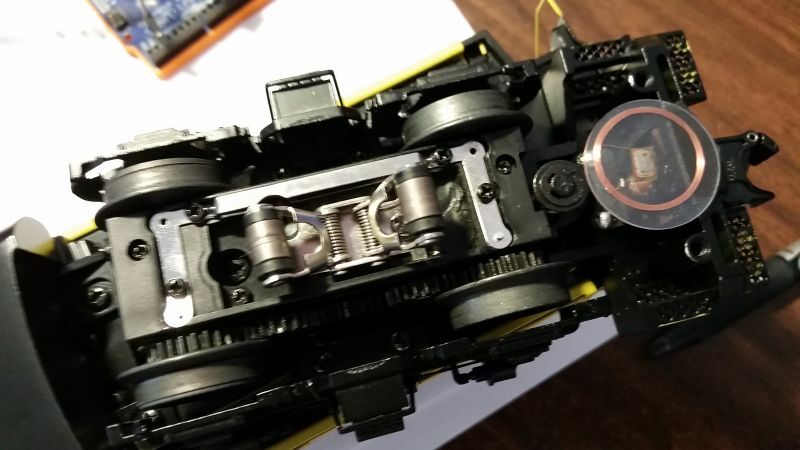 Ray's implementation uses a tag reader under the track (he uses FastTrack) with tags mounted under the engine. Ray has an RFID tag reader under the track. It connects to an Arduino and an Elechouse CC1101 radio. He has the Arduino programmed to send out an SXS command each time a train is detected. He uses the UID on the tag to know which engine was detected so that SXS command addresses the right engine. This document describes an RFID implementation in HO. Doing it in HO gauge is much, much harder. I'm looking at an implementation similar to Ray's. 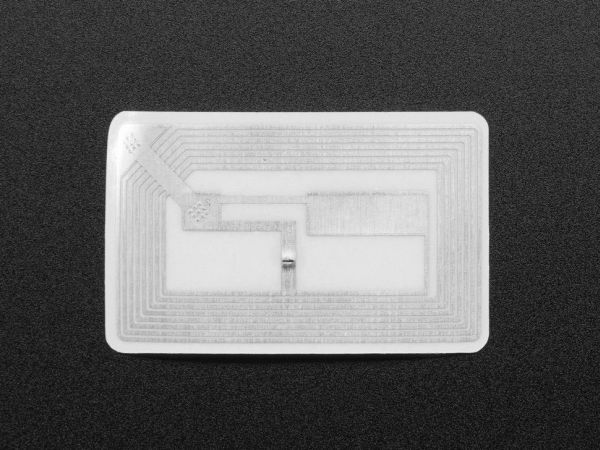 I envision a scheme where there are RFID tag readers at strategic places around the layout. RFID tags are attached underneath every engine and car on the layout. Tags are loaded with information about the engine/car to which they are attached. A control computer could then use that tag information to control the engines. I would use the radio and commands that I developed for the RTC program using OOK transmission codes. Needs to be cheap. I chose the 13.56 MHz tags. I plan to put two tags on each engine, one on the front truck and one on the rear truck. Cabooses will have one tag on the rear truck. All other cars will have a tag on one of the trucks. I plan on each tag having information about its distance from the end of the car. I hope to be able to couple/uncouple, pickup and drop off cars automatically via the control computer. So what can we do with this. I envision a "smart" Master Control program which gets the tag information and controls the trains. Say, for example, you are running one freight train, doing switching to drop off and pick up cars. Let a computer run another freight train in the other direction. The computer would know where your train is and control the other train to take sidings to keep out of your way. Or maybe, the computer controls a 1st class train over the layout while you, controlling a peddler freight, have to figure out how to keep out of the way of the 1st class train while still doing your work. Here is the hardware that I looked at and the hardware that I finally selected. 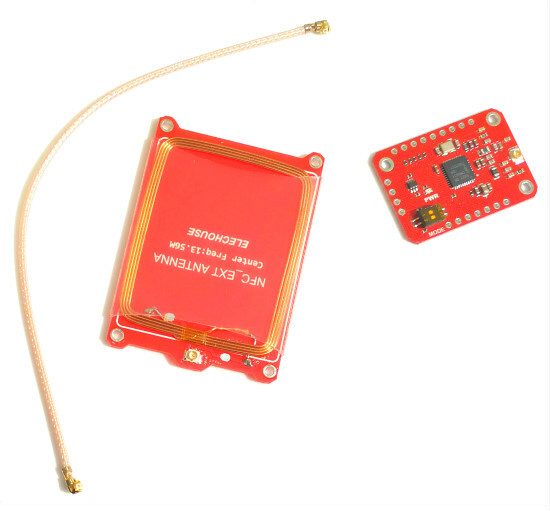 I looked at three different RFID tag reader boards. They all operate at 5v although they might operate well enough at 3.3v. I bought this board on eBay(search for PN532). It has the antenna adjacent to the circuitry. I attached it beneath the track with the "NFC" logo under the tracks, facing up. This is a 3.3v board. It has a 5v to 3.3v voltage regulator on it. SPI inputs must be 3.3v levels. This board is from Elechouse. I attached the antenna under the track with antenna side facing downward. According to the web page : "On-board level shifter, Standard 5V TTL for I2C and UART, 3.3V TTL SPI " and " SPI: 3.3V TTL with 100 ohm resistors in series. 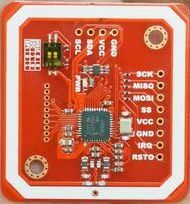 It could be connected directly to 5V interface of microcontroller such as Arduino." I selected several different tags to test. All of these tags could be programmed with up to 768 bytes of information. They all operate at 13.56 MHz. 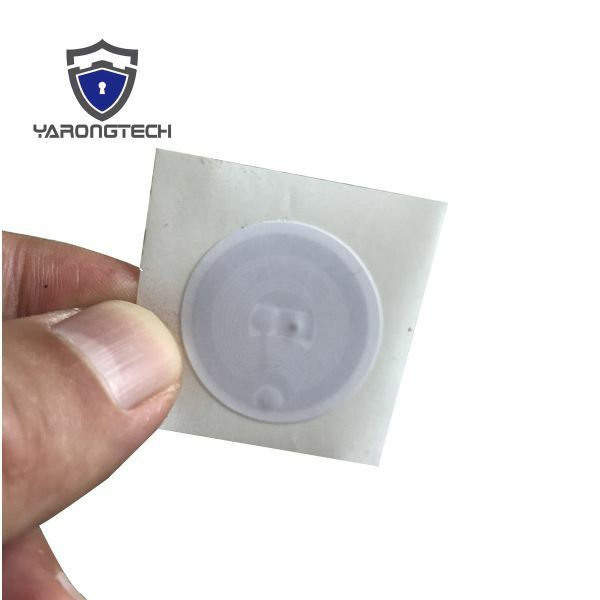 Found on eBay, these transparent NFC tags were mounted on a 25 mm PVC disk. Also from Adafruit, this sticker style tag. 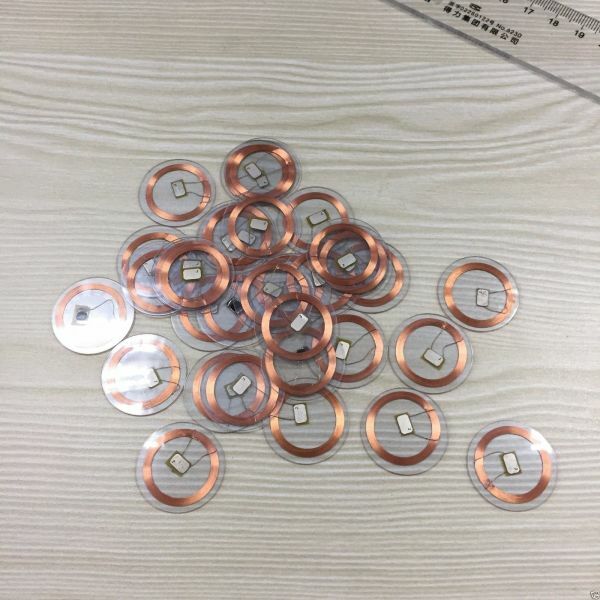 Size: 41mm x 24mm x 0.2mm / 1.6" x 1" x 0.008. Per the Adafruit web page : "Works about 2.5" away from reader". Wow - that would be great, but these tags were pretty large. I used a version of the Arduino called the Infiduino. It can run at both 5v and 3.3v so I could test the RFID tag reader boards at both voltages. 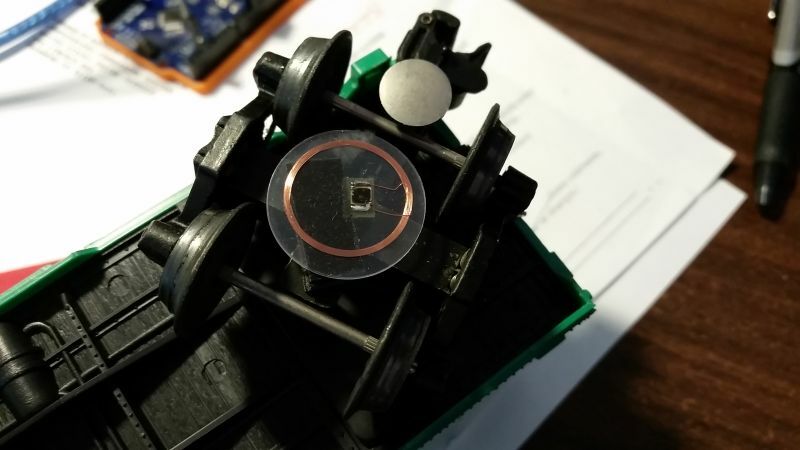 All of the RFID tag readers that I tested can connect to the Arduino three different ways. I used the SPI (Serial Peripheral Interface) method. SPI uses a simple synchronous serial communications with a separate select line. The other connection methods HSU (High Speed UART) & I2C (Inter-Integrated Circuit) only allow one tag reader per Arduino. Using the SPI required small switches on the tag reader board to be changed (the boards default to RS232 style HSU serial connection). I connected the SSn/CSn pin of the tag reader to pin 10 on the Arduino. I conected the other three SPI pins to the ICSP header on the Arduino. Look at the drawing above for MISO (pin 1), SCK (pin 3) and MOSI (pin 4). I then used +VCC (pin 2) and ground (pin 6) on the ICSP header. The Arduino required libraries to interface with the RFID tag reader boards. There are several libraries floating around. The one I used can be downloaded from here. The downloaded file should be named PN532-PN532_HSU.zip. Once you unzip the file, you should have five folders inside of a top level folder. Move these five folders into your Arduino Libraries folder (usually at : C:\Users\<username>\Documents\Arduino\libraries). I wrote a simple test program based on the examples in the Arduino PN532 library. Using the Arduino IDE, I displayed each tag as it was detected. I mounted each tag reader underneath the track. I mounted the tag at the lowest spot on the engine that I used. Knowing that the metal of the engine would affect the operation, I mounted the tag with double sided foam tape so that as much of the tag as possible was in "free air" and not near metal. There were clear winners. First the really large tag worked the best. But it was too hard to mount inconspicuously under the engine or car. The smallest tag did not detect at all. The tag in the transparent PVC mounting was the best overall. It was solid enough to be able to extend into "free air" without distorting. The round white tags were too floppy and tended to get "picked" by the switch tracks on my layout. 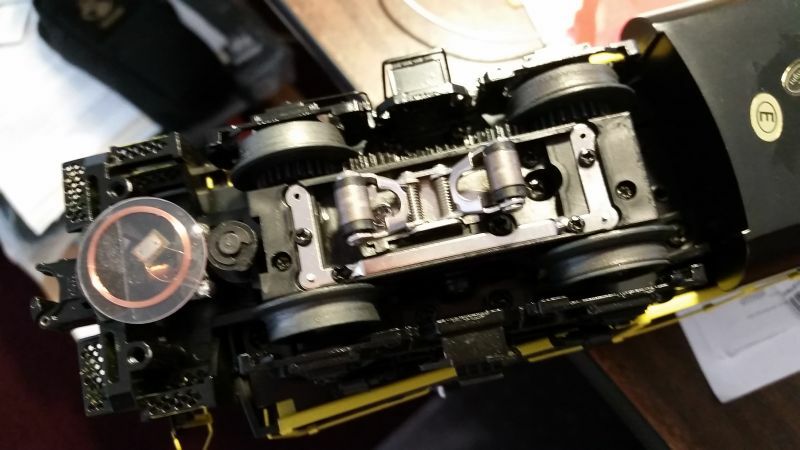 For the boards, it was clear that the Elechouse version with the separate antenna was the best at detecting tags through the metal 3-rail tubular track. I tried the tag reader boards running at both 5V and 3.3v. There was no detectable difference between the voltages. One of my goals was to have multiple RFID tag readers attached to each Arduino. The three common control lines (SCK, MISO, and MOSI) are connected between the Arduino and all the tag readers. The fourth control line (SSn/CSn/SCL) is unique to each tag reader. 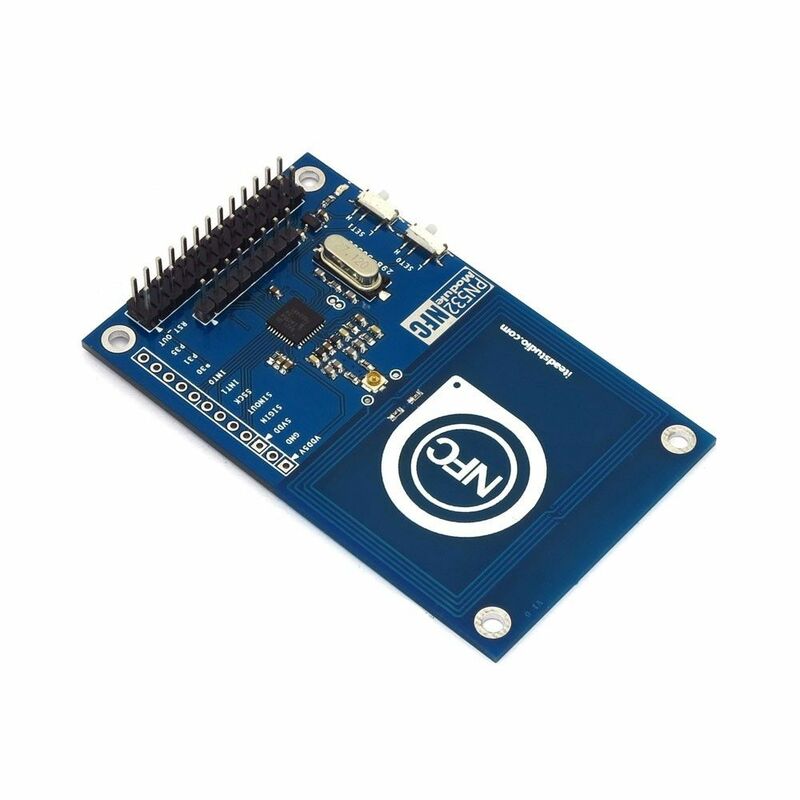 SSn can be connected to digital pins 2-10 and analog pins 0-5 for a total of 15 tag readers attached to each Arduino. The most I have tested is 4 tag readers. I'm thinking that one Arduino would handle train detection for a passing siding. That would be 6 tag readers, 3 each surrounding each of the two switches that make up the passing siding. That way you can detect trains entering the leaving the siding on all tracks. Mark's note: later testing (which required modifications to the code) caused me to limit each Arduino to 6 readers, see below. I had to edit two files in the PN532 library. 1. The library allocates a 255 byte buffer for each tag reader. An Arduino with 15 readers would then require 3825 bytes of RAM. Each Arduino Uno only has 2,048 bytes of RAM so we would have a problem. uint8_t inListedTag; // Tg number of inlisted tag. Once you make this change, the example NFC sketches in the downloaded library won't work any more unless you add the declaration of the buffer in each sketch. Next get a copy of the header file, RTC_NFC.h, that I wrote that includes the defintion of the information loaded into the tag. The header file also includes the definition of the RS-232 packet sent by the Arduino back to the Master Control computer over the serial connection. You can download that file from here. Create a folder inside your library folder (next to the NDEF and PN532 folders). Name it RTC_NFC and place my header file RTC_NFC.h into it. Spend some time studying this header file as it defines all of the import tag and communication information. Here is a copy to look at. If you are going to actually do some programming, download the latest version of the file using the link above. along with Remote Train Control. If not, see <http://www.gnu.org/licenses/>. uint8_t n3; // -- Up to 6 digit engine/car number in ASCII (w/leading zeros) "002808"
uint8_t CarNumber; // Up to 6 digit engine/car number in ASCII (w/leading zeros) "002808"
Using one of the examples supplied in the library, I wrote a sketch, which I called RTCNFC, to monitor up to 15 tag readers and when a tag is detected to send a packet of information out of the hardware serial port. NOTE: this program has been superceeded by RTCNFCIRQ. Latest source code is at the bottom this page. // typically pin D10 is used by the CC1101 radio if that is used in your implemetation. // In this sketch, A0 is used for the LED. Each board must be given a unique board number using BOARDNUMBER. Tell the sketch how many tag readers are attached using READERCNT. PortAddresses should list, in order, the Arduino pins connected to the CSn/SSn line. Only the first READERCNT pins are actually used by the sketch. I picked this order randomly and you can use any order. My sketch uses A0 for the LED and 10 is reserved for a possible radio. Note: later I used pin 8 for the LED. On this Arduino (video #2), I've connected up SCK, MISO and MOSI. SSn/CSn is connected to pin A5 (Any of 15 pins can be used, I picked this one). 5v and ground are connected. For an indicator, I used an LED on pin A0. This LED blinks whenever a tag is detected. Tag is mounted under the track with antenna side down so that there is no chance of shorting the antenna to the track. I'll explain about the white wires a later on this page. On this Arduino (video #3), I've connected up SCK, MISO and MOSI to 4 tag readers. Sn/SSn from each tag reader is connected to pins A5, 2, A3 and 3 (Any of 15 pins can be used, I picked these). 5v and ground are connected. For an indicator, I used an LED on pin A0. This LED blinks whenever a tag is detected. For my testing, I only used 3 of the readers which you can see placed underneath the track. Mark's note: All of this code was moved into the separate sketch RTCNFCProg and out of the RTCNFC sketch. The RTCNFC sketch can also write engine/car information to the tag. This information is sent out the hardware serial port when the tag is detected. This will write tag data to the first tag detected on tag reader 0. Setup the data to be written by editing the sketch (I know that this not a really good solution and I need something with a better user interface). So fill up the data structure Tag.CarData and Tag.CarName. The first of these will be written to block 4 of the tag and the second to block 5. The data written from Tag.CarData is read up when a tag is detected and sent out the hardware serial port of the Arduino. Here is the section of the sketch RTCNFCProg.ino which sets up the tag information to be programmed. // Up to 6 digit engine/car number in ASCII (numbers and letters w/leading spaces) " 280X"
I'll write more instructions about this later. I used an Arduino Mega2560 as the Master Control computer (video #4). Its also possible to use a PC. The Mega is powered by a 12v wall wart. The Mega receives tag detection information from each Arduino over the hardware serial port #1 ("Serial1"). Almost any kind of program can be written to act on tag detection by the Arduino. Command packets can be built and sent out the radio (see next section) to a TIU to control engines and accessories. Now we can finally implement the functionality of the Lionel 132 Stop Station. The radio I use is a TI CC1101 based radio from Elechouse. Note that the image on their web page says RF1100SE but I received the correct version labeled RF1191SE-V3.1. 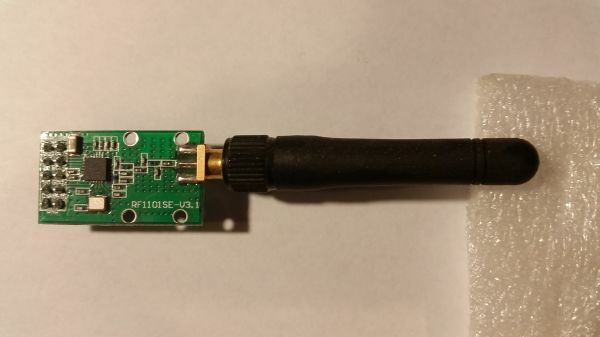 This is a 3.3V device and no signal pin can be connected to a 5V Arduino output. I connected a big (330µf) electrolyitc decoupling capacitor between VDD (pin 2) and GND (pin 10) on the radio board. I don't know if this is really doing any good or not. You can make it optional. Be careful when you connect up the radio. This is a TOP VIEW (or COMPONENT SIDE VIEW) of the board. The pins actually stick out the back side of the board. Compiling a sketch which uses the CC1101 radio from Elechouse requires my library CC1101E. You can download it from here. In your local Arduino Library folder, create a folder named "CC1101E" and put the CC1101E_OOK library files in it. Since the CC1101 radio can only handle 3.3v signals, I used a simple (and cheap) level convertor. I found these on eBay. These are bi-directional and can easily handle the SPI command interface to the radio and speed of data TX/RX to/from the radio (9600 baud). I level shifted 4 signals: SCK, MOSI, SSn/CSn, and GDO0. Signals going from the radio to the Mega do not need to be level shifted, the Mega can correctly read them even as 3.3v signals. On the Mega, I connected pins from the ICSP connector to the radio. My goal is to have many Arduino around the layout all feeding tag detections back to a control computer (a Mega2560 or a PC). Each reader sends out a packet of information when a tag is detected. The hardware serial TX output of one Arduino is connect to the RX input of the next Arduino. Each Arduino monitors its RX pin and when a packet is received, it is forwarded out the TX pin. Eventually the tag detection information all ends up at the control computer. This video (#5) shows the interconnection between the Arduinos and the Mega. Connecting them is a four wire "telephone" cable. Three wires are used : 12v raw power (VIN), ground (GND), and serial data. The 12v raw power from a wall wart is plugged into the Mega. The VIN pin sends that voltage down to the string of Arduinos. Each Arduino uses its own voltage regulator to generate 5v for itself and its associated tag reader boards. The hardware serial TX pins are not really designed to send signals over telephone cable and I'm violating the RS-232 spec here but it seems to work. I've got about 10-15 feet of telephone cable between the RX and TX pins. I'm running the hardware serial lines at 115200 baud. I wrote a sketch for the Mega (video #6). The sketch receives, on "RX1" (but on the Mega, labelled "TX1"), the tag detection information from the two Arduinos. The sketch then uses the tag information to send commands over the radio to the TIU and engine. This is a fairly simple sketch that rings the bell, blows the whistle and adjusts the engine speed. I called the sketch RTCMegaMaster. The video (#8) will describe what action is taken as the engine passes over each tag. I edited my sketch called RTCMegaMaster to make it a little more complicated. I added commands to change the engine direction and play a few different sounds. The program also is more random at issuing commands so that it is not just a repeating sequence (video #7). Of course, this isn't doing anything real world-like. I have updated the RTC program with the same code functionality as the Master Control program in the Mega. Since this is a development project, there are still unanswered questions. I present my list below. Paul Reynolds sent me some questions about my questions and I added my answers here (Paul's comments in Red). 1. How reliable will the tag detection be? > You may need to employ redundant systems, e.g. 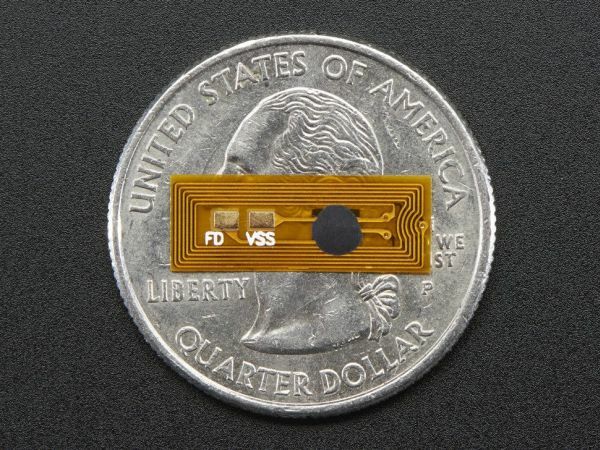 RFID and video, or RFID and bar code scanning to get high reliability. Right now, the tag is 3 mm above the track, the track is about 10 mm thick and the antenna is on a 1 mm thick circuit board. So detection seems good at that 14 mm distance from the antenna but I don't know the maximum detection distance. Since I plan to put a tag on every car, I will have to keep that tag as close to the track as possible. 2. Can an Arduino really handle 15 tag readers? > Are you worried about current draw? Too high a workload? I'm not too worried about current draw. I can always add more 12v current and use separate 5v regulators for the tag readers (right now, I use the Arduino to make the 5v for the tag readers (Mark's note: I have now wired in separate 12v to 5v voltage regulators for the tag readers). 3. Can the hardware serial interconnection scheme handle the detection packet traffic? > topology? For a few more ports you can reduce path length, and thus node visits, exponentially. In my scheme, all of the Arduinos are "in series" with respect to the RS-232 lines. That means the most upstream Arduino is relaying the packets from all other Arduinos while at the same time handling its own attached tag readers. I am using the hardware serial port only and running it at a very high baud rate (115,200 baud) to try to reduce this problem. 4. Is a Mega powerful enough to work as a control computer or will a PC program be required? > Never used a mega, but I'm not bothered by using a low end PC as the controller. > You could use the PC to do other tasks so its capability is not wasted. I agree, it will probably require a PC. That brings up the issue of writing a control program that is not deterministic. We would want a program that simulates an train engineer in each cab, making decisions on the fly about what to do rather than a rote step 1, step 2, etc. That is a whole 'nuther can-o-worms. 5. What happens if two tags are detected by two tag readers at the same time? > Answer depends on whether this question pertains to one Arduino with near simultaneous inputs, or multiple Arduinos with near simultaneous inputs. > The latter shouldn't be a problem. If you're polling the readers from a single Arduino, couldn't you capture inputs in a time-switched manner? > Reader output probably isn't all that fast..
As I mentioned earlier, I am worried about a tag reader never getting a chance to read out its detection to the Arduino. Right now I poll the readers one by one. I might be able to change this to a interrupt driven scheme. Mark's note: I eventually did change to an interrupt based scheme, see below. 6. What happens if the hardware serial connection is overloaded? > concurrent reader inputs? Multiple comms from other Arduinos? Both? The upstream Arduinos might have a lot of RS232 traffic to forward up to the next Arduino. The hardware serial port can handle fast RS232 but its buffer could still possibly overflow. The Arduino Mega2560 has 4 hardware serial ports so I could make four serial pipelines going into the Mega. 5 May 2018 - My first concern is reading the tag information before the tag moves off the reader. I wrote a test sketch using the Arduino with 4 tag readers. 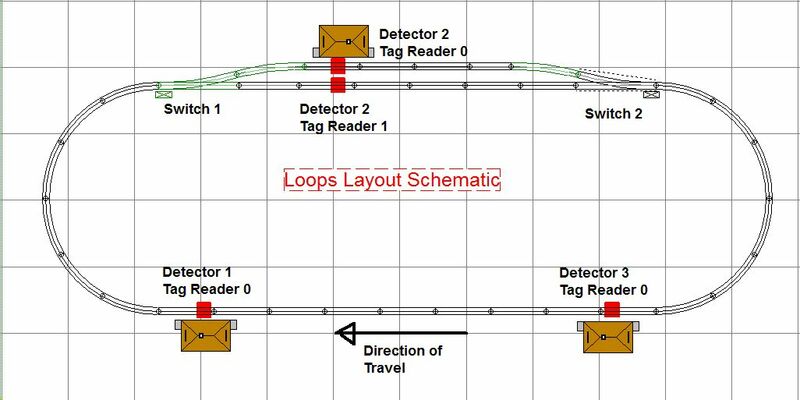 The sketch counts the tag detections as the train goes around the track. It alerts if a tag is missed. I believe that this is too much to do with the engine running at a reasonable speed. This works ok if the engine is running at 5-10 Smph but get into the 20's or higher and the tag moves off of the reader before all of this work can be completed. 2. send that information to the Master program. This worked much better but can't run more than a few minutes without missing a tag. So my first major rewrite of the sketch occurred. Up until now, the sketch polled each reader one at a time to see if a tag was over the reader. I completely changed that to use interrupts. This required an additional wire between the reader and the Arduino. For each reader, I connected a wire between the IRQ pin on the reader and a pin on the Arduino. To keep the pin usage in check, the new sketch will only support up to 6 readers (I'm still testing with 4). I call the new sketch RTCNFCIRQ. // for interrupt - IRQ signal. 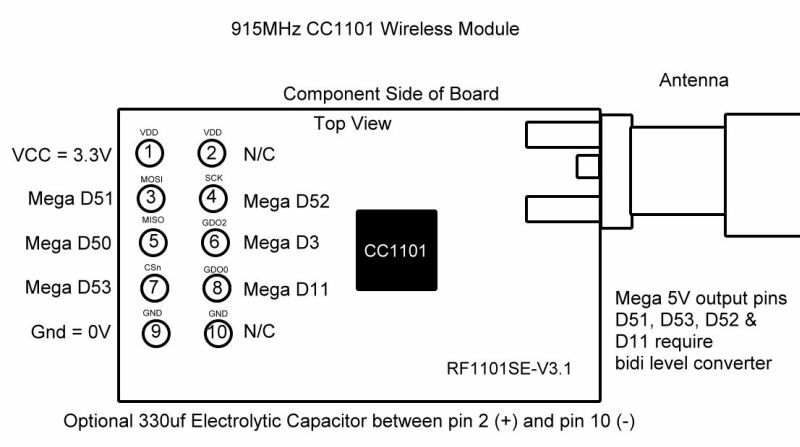 // typically pin 10 is used by the CC1101 radio if that is used in your implemetation. // In this sketch, 8 is used for the LED. This change improved the detection. Instead of polling each reader, the Arduino just sits in a loop waiting for an interrupt to be signaled by a reader. But I think I'm still seeing the case where the tag is detected but by the time I get to read the tag, the tag has moved off the reader. 1. enableRead() - this routine turns on the RF field to power the next tag. Then when a tag arrives, the reader remembers the tag UID and sends an interrupt to the Arduino. Then the Arduino quickly reads up the tag ID (UID) by calling the next routine. 2. readTargetID() - this routine just fetches that saved UID. The tag detection looks really good right now (video #8). I had to give up (at least for a while) my idea of keeping engine/car information in 16 bytes of the actual tag. I just can't read that out when running at speed. I'm thinking, though, that I can put a reader at the exit/entrance throat of my staging yard, where trains run fairly slow, and right there, read up the engine/car information and save it in the Master program. Then on each tag detection, the Master program can look up the 16 bytes of information. See below where I discovered a method to really improve the tag detection. Mark's note: I had also written a third new routine, releaseLastTag(). I never used it but it remains in my copy of the modified files. Here is the top of the PN532.h file. The change is exactly the same as described above. Add the declarations for the three new routines to the "public" section of the class. Make the one line change to the beginning and end of the header file. Here are the new routines added to the PN532.cpp library code. length of the card's UID. I rewote the code which filters out multiple detections of a tag as the tag is passing over a reader. This is a potential problem when the train is moving slowly over a tag reader. The sketch now remembers the last tag ID for 500 ms. If that tag ID is detected again within that time, it is dropped and not sent to the Master control program. The control program should also implement it's own duplicate tag detection on top of what I did. I increased the size of the buffers used by the hardware serial ports on the Arduino and the Mega2560. In the Arduino IDE folders, there is a file named "boards.txt". This file contains definitions of all of the boards understood by the IDE. I took the "Arduino/Genuino" and "Mega 2560" entries, copied and renamed them, and added two options to the build line. These options increase the buffers on the Arduino to 128 bytes and on the Mega2560 to 256 bytes. I changed the names to "Uno Big RX/TX Buffer" using "unoB" and "Mega 2560 Big RX/TX Buffer" using megaB. You should select one of these on the Tools->Board menu of the IDE. I'm not sure that this change is necessary but I thought I should use the biggest reasonable buffer sizes to minimize possible buffer overflow on the serial connections. 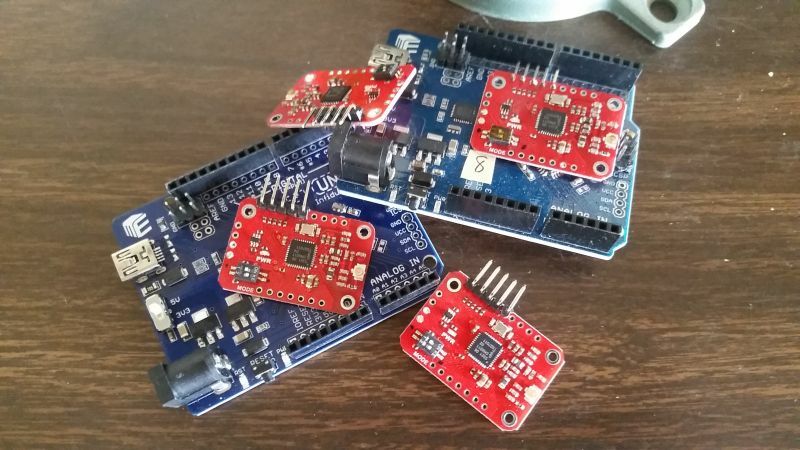 The original Arduino/Genuino and Mega 2560 boards can still be selected for other projects. 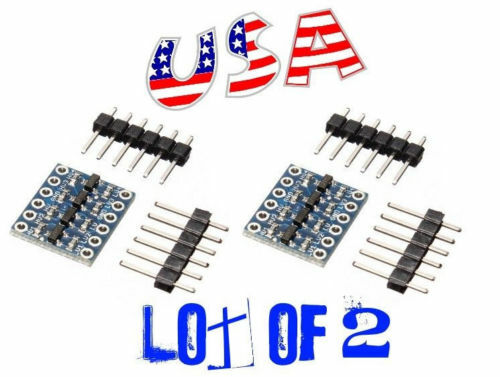 This method of making the change means we don't have to modify the library HardwareSerial.h source code (the support for these two flags is already built into Hardware Serial.h so no changes are needed to library files.. But the verdict on this change is still not in. I'm not sure it makes any difference. So tag detection was working really well as long I only read the Tag ID (UID 4 bytes) on each detection. My original plan was to encode 16 bytes of information in each tag that described the engine/car. The contents of these 16 bytes is described in the struct "ED" as shown in RTC_NFC.h. I enabled that part of the code by setting SENDENGINEDATA to true. I got my short train running around the circle. I was still missing detection of about 10% of tags - not a good percentage when the engine is about to run off the edge of the layout. I experimented with changing the code and repositioning the tags under the track. Nothing made any difference. As I was narrowing down my problem with unreliable train detection, I was thinking that an Arduino with 4 tag readers might be pushing the power supply current limit as the RF field is turned off and on. This could cause a voltage drop which could make the tag reader less sensitive. And I realized that the Arduino with one tag reader was getting 100% tag detection and 16 byte engine data readout. Gee those LED's on the boards flashed bright! So it took me several hours to reassemble (slowly and step by step) another Arduino and 4 new tag readers. I took great care to connect the decoupling capacitor across only the 12v power supply. At the same time, to ensure enough current to the readers, I powered this Arduino with a separate 12VDC wall wart power supply. Remember at 50 Smph, the tag is over the reader for only 75 ms.
A more complicated demo that starts to show how this tag detection system along with a radio could be used to control a layout. The Arduinos with the tag readers are running my RTCNFCIRQ program. They monitor the tag readers and when a tag is detected, they read the 16 byte engine/car description and the tag ID (UID) from the tag. That information is packaged up and sent out the serial port to the Master Control sketch. The Mega2560 is in overall control of the layout. The sketch (RTCMegaMaster) in that computer starts up the engine at the beginning of the run and then receives the tag information from all of the readers on the layout and acts on that information. The Master Conrol sketch creates correctly formated commands which are sent to the CC1101E radio attached to it. Those commands are then passed on by the TIU to the engines on the track. The demo uses an AIU to control two 022 switch tracks and a 145 Gateman. Once the engine is started in the forward direction at 11 Smph, the sketch waits for a tag detection from any of the tag readers. All of this action is coded in the sketch running on the Mega (this can all be done on a PC also). The first tag that the control sketch cares about is the tag on the caboose. The 16 bytes of information read up by the tag reader contains data which identifies that car as a caboose and includes the car number. Once that tag is detected, the sketch builds commands for the TIU that stop the engine, reverse direction, throw the switch tracks and start the engine moving. The engine travels over the layout until, at the other end, the tag on the front truck of the engine is detected. When that occurs, the control sketch stops the engine, reverses direction, throws the switches and starts the engine in the forward direction. This time, the engine takes the siding. The Gateman is controlled by the control sketch also but the sketch is programmed to wait 15 seconds before commanding him to pop out. Actually any command can be delayed by any number of seconds for actions that have to happen some time after a tag detection. I use this method when an engine begins to move to sound the bell and 2-3 toots on the horn. Another more complicated demo that starts to meet my goal of running a layout. Remember that this is all being controled by the Master sketch running on the Arduino Mega 2650. So this demo swaps the two cars around. The demo can run over and over, each time doing the swap. Coupling and uncoupling was the hardest part of this demo. When coupling, you have to have Charlton Heston's help and be running at "Ramming Speed". In my demo, that meant the engine had to be going about 20 Smph. Not very realistic. This was a real issue as many boxcars and gondonlas are too light. When you push against their coupler with an engine coupler, rather than holding firm and letting the coupler couple, they tend to just get pushed down the track. I found that the green boxcar that I used weighed 12 oz. According to the NMRA, a 10 inch O scale car should weight 5 oz plus 1 oz for each inch of length - or in this case - 15 oz. It made a little difference when I added 3 oz of lead weights to the car. But with these Delrin journals and fast angles wheel sets, the cars don't put up much resistance. In my demo, I try to couple onto one car - a consist of 3-4 cars would offer more resistance. The 8 inch long caboose was already pretty heavy at 18 oz. Uncoupling was a problem also. I found that the engine had to be moving at the instant the uncouple command was executed so that the engine would pull away from the car. I also tried uncoupling on the fly to add some interest - that worked pretty well. With some improvements to the RTC program (used as the Master Control program) and small changes to the train detection and control scheme in the RTC program, I have a looping demo running on my carpet test track. My goal has always been to increase the reliability of the train detection to as close to 100% as possible. Changes to the RTC program. One the RTC program web page, you can read about the changes that I made to the communications code in version 3.27 of that program. These were some major changes and made the communications between the program and the TIU/engine much more reliable. 1. I had always planned to put two tags on each engine, one at each end. The intent was to be able to determine which direction an engine was moving when it passed over a detector. Since I had two tags, I changed the train detection to watch out for both tags. If it missed one, it might detect the other one. 2. For each tag detected, I save the UID & block 4 (engine data) in a lookup table. In my earlier testing that you can read about above, I've often seen a failure where the tag passes over the reader too quickly for the block 4 data to be read out. So when I start the demo, I run the engines slowly at first and as each tag is detected, I add that tag and block 4 data to a list. Then later, when running at higher speeds, if the detector can't read the block 4 data but gets the tag UID, I lookup that UID in the list and use the previously read up block 4 data. On the advice of Mike Hewett, I send all of the critical commands twice. Even if the TIU responds that the command was successful, I still send the command again. This is most useful for the speed & direction commands. It is absolutely critical that the engine go in the speed required and in the direction required. I also do this for bell off and horn/whistle off because its annoying if they don't turn off. This might be overkill. Here are three videos of my loop demo. The first describes and shows the operation of the engines on the test track. The second shows that PC screen when the RTC program is controlling the engines. The third is after I moved the RFID detectors to my layout in the train room. That's me narrating the videos. As Mike Hewett pointed out, one of the limitations of the new "Program Control" ability of RTC is that you have to know how to program in C++ and have the complete RTC development environment on your computer. Look at this page for my solution. I'll try to keep these zip files up to date but if you are going to seriously work with them, email me to be sure you have the latest versions. RTCNFCIRQ This is the new sketch using high speed interrupts and the FastDigital library. Download here. RTCMegaMaster The new Master control sketch. Download here. RTCNFCProg I took the tag writing code out of each sketch and made up a new sketch called RTCNFCProg. Use this sketch to program the 16 bytes of engine/car information into Block 4 of the tag. Download here. RTC_NFC Library You will need the RTC_NFC.h header file from the RTC_NFC library. Download here. PN532 Library Patched by Me The original library with the new routines in PN532.cpp and PN532.h. These files are in the folder named PN532_modified. Download here.